Reset architecture has designed a multipurpose theatre pavilion with a hall for 200 seats in the woods of ‘Zonnewende group stay’. 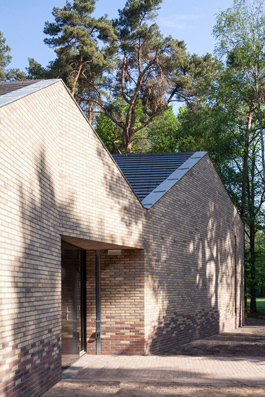 The sturdy brick building is designed to blend into its surroundings but also to stand out. ‘The Zonnewende group stay’ accommodation was founded in 1932 with the purpose to give city children an opportunity to be outdoors in the woods for a healthy short break. This social approach has not changed much. Today, they offer 250 beds to large groups of young people at a cheap rate. Mostly for school camps, communities of faith, and music and sports clubs. The domain of ‘Zonnewende’ is part of a nature reserve. On the grounds of the holiday park you find dense woods of deciduous and coniferous trees combined with open spaces for sports and playing fields. Barracks in the woods are used by guests for theater and musical performances, parties or other activities. A 220 m² derelict barrack is now replaced with a 430 m² pavilion, offering space for 200 seats in a multipurpose theatre hall. The theatre pavilion was constructed in a short time during the winter when Zonnewende is closed, lack of time and a limited budget required a pragmatic design. The plan has a clear organization composed of two zones; the multipurpose theatre hall and all additional program, including the entrance hall and a bar with kitchen. Due to the presence of the stage, the organization of the theatre hall becomes clear through its apparent direction of flow. At the same time, the contour of the hexagonal space also provokes other use. In this space you can see the deformation of the building. This dynamic experience is emphasized by the contrasts in the spatial order and the used materials. The pavilion is built with a prefabricated timber frame construction that is also the finishing of the interior. The inner wall between the room and the hallway form a unit with the roof through the use of birch wood. In order, the five rafters consistent with the wall and the roof, and give a clear organization of space. The contrast is created by the white timber outer wall that folds freely. The wall claims its own logic, which is also emphasized in the divergent position of the openings. The openings evade the organization of the construction structure, a second order is introduced and hereby an enrichment of the architecture. This layering in order is also noticeable outside, behind the glass of the rectangular frames; it gives a second division in the windows.